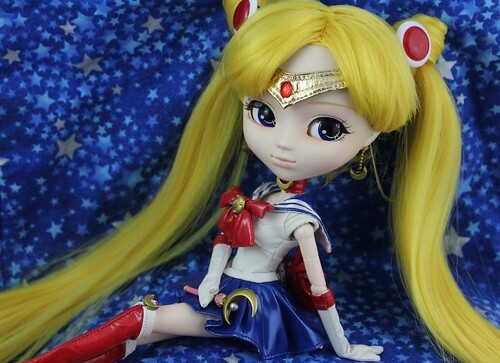 ← Pullip x Sailor Moon Collaboration: Pullip Princess Serenity details announced! This year marks the 20th anniversary of Sailor Moon, tons of new merchandise as well as a new anime series have been released to celebrate the anniversary. Of course, one of the most exciting things to come out of the anniversary celebration is a collaboration with Groove to release dolls based on the different characters in the series. 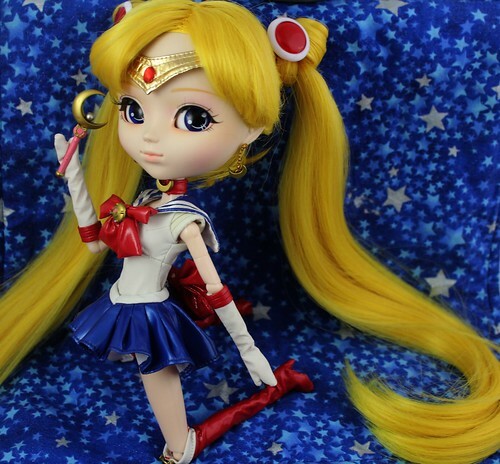 The Sailor Moon x Pullip debuted in July with the release of Pullip Sailor Moon, since then Sailor Mercury has also been released; Sailor Venus and Princess Serenity are still currently in the preorder stage. 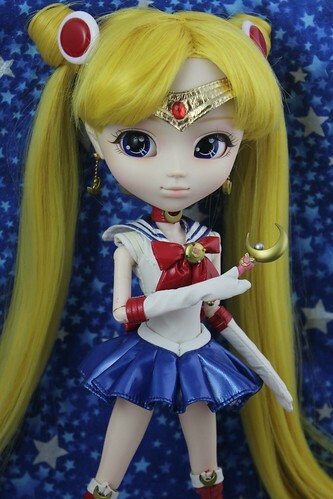 As a big fan of both Pullip and Sailor Moon this series seems destined to destroy my wallet. 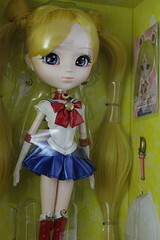 Pullip Sailor Moon has a MSRP of 16000 yen, I bought mine for $135 via Pullipstyle. 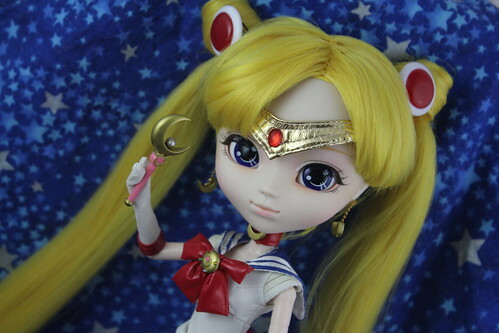 There was a Bandai exclusive version of Pullip Sailor Moon that came with an adorable Luna plush which has since sold out. As cute as the Luna plush was by the time I would have paid for a shopping service and international shipping well that cute little Luna plush would have ended up costing me about an additional $75 versus ordering from Pullipstyle… the Luna plush isn’t that cute. For Love and Justice, The pretty Sailor suited soldier Sailor Moon!! In the name of the moon I will punish you!!…. Feel Like So. 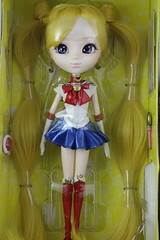 Pullip Sailor Moon comes with her sailor suit with removable skirt, boots, choker, gloves, tiara, earrings, hair accessories and moon stick plus the standard card and stand. Her stock is made almost entirely out of pleather, including the boots and tiara. 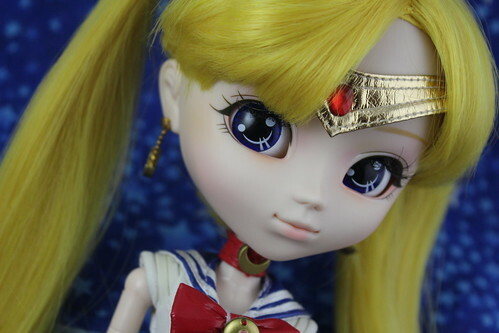 The tiara has two hair clips which you can stealthily use to clip the tiara into place on Sailor Moon’s forehead. I would have preferred it if her outfit wasn’t made out of vinyl but it was a lot nicer than I was expecting when I actually saw it in person and had a chance to handle it. 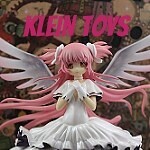 She is a very faithful recreation of the character. I wish in the future Groove would include an instructional sheet on how to correctly affix the hair accessories, I just kind of jabbed the bobby pins through her buns I have no idea if that was actually what I was supposed to do or not. Sailor Moon’s hairstyle is honestly pretty complex, while the wig is soft I’ve heard that some Sailor Moons have thicker hair than others. Mine’s wig is in pretty good condition so I don’t really have any complaints, I can only imagine what type of a nightmare it is to try and manufacture a wig with such a complex design. Sailor Moon is a very fresh faced girl with natural make up, she is only supposed to be a young girl when the series starts so it makes sense for her not to be all done up with really dramatic make up. 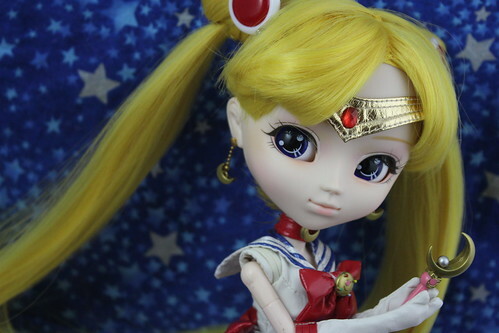 Her face up is nice and should be very versatile meaning she would look great in a lot of different wig/eye chip combinations if you ::gasp:: aren’t a fan of Sailor Moon. I love her eyechips they are very anime-like though I think she should have technically been a little bit of a brighter shade of blue. I can understand why Groove would make the outfit out of vinyl, I’m not the biggest fan of the choice but it works; I really feel like they should have at least made the boots out of a different material though. The pleather boots never look right to me, the way they move just makes it seem like they would be incredibly uncomfortable. 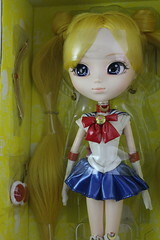 Sailor Moon comes with her moon stick which she received from Luna in episode 25 of the original anime series. I remember this quite well because one of my favorite characters Zoisite was the first villain to fall victim to it though it was Queen Beryl was the one who finished him off. Sailor Moon continued to use the moon stick through the remainder of the first season and the first few episodes of R before being replaced with the Cutie Moon Rod. This may or may not be immediately noticeably so I thought I should mention that Sailor Moon does come with a grippy hand to hold the wand. Getting her to actually hold the wand in her grippy hand can be kind of tricky because of the gloves but it would be next to impossible if she didn’t have a grippy hand. I’ve been hoping and waiting for a Sailor Moon Pullip for quite some time so I may have had just a little too much fun photographing her and trying out some dynamic poses with her. I love how faithfully her accessories are recreated, she has her crescent moon earrings plus the motif repeats on her choker as well as her boots. Sailor Moon’s transformation brooch that she receives from Luna in the very first episode is also faithfully recreated. 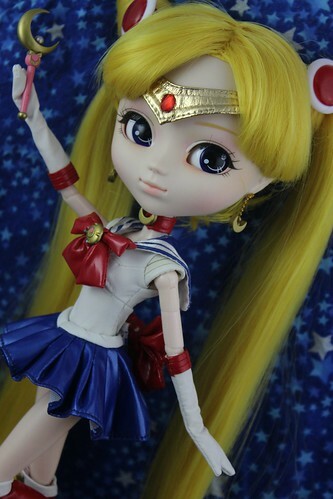 Sailor Moon was one of the first anime that I ever watched so playing with the Pullip filled me an overflowing amount of nostalgia. 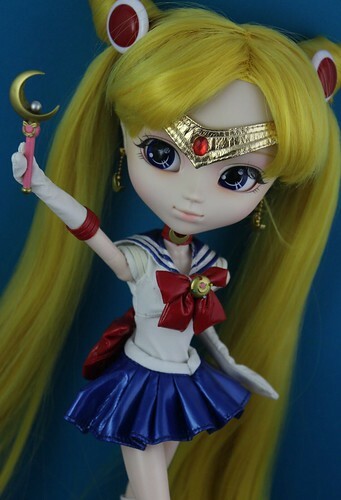 I can’t wait for the blu-rays of the original anime to start coming out soon, this has been such an incredible year for the Sailor Moon fandom with the new anime/old anime coming out on blu-ray/tons of new merchandise including the collaboration Pullip series. Her eyelids have just a hint of color to them. 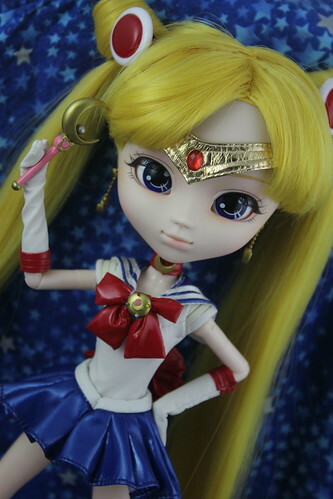 This collaboration with Sailor Moon is one of the most exciting collaborations that Pullip has done for me anyway. I look forward to seeing more dolls in the line especially since as Groove releases more and more photos of the other upcoming dolls it looks like each release is getting stronger than the one that came before it. I expect great things Groove, so don’t disappoint me! I still hope they at least release dolls of a couple of the villains so Sailor Moon and friends will have someone to battle otherwise they will be facing off against the evil sea witch Jaldet for lack of a better alternative. 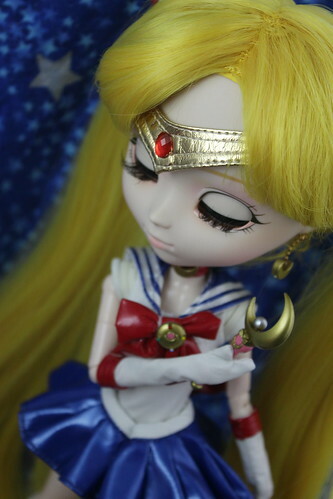 More photos of Sailor Moon are available on my flickr. 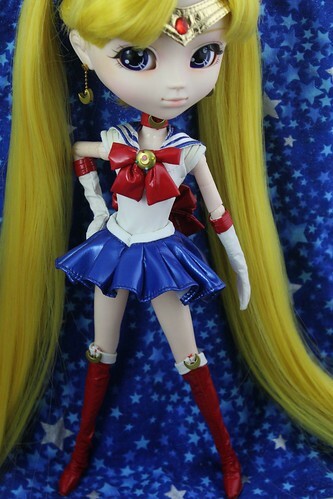 Pullip Sailor Moon is available for purchase via Pullipstyle and/or JPGroove. 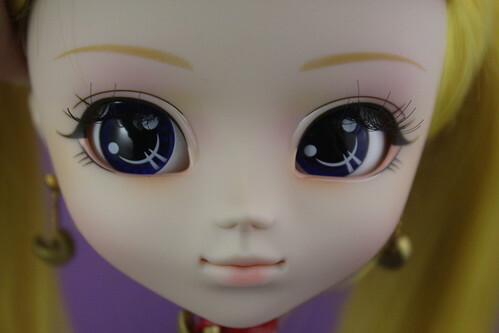 This entry was posted in Doll, Pullip and tagged bishoujo senshi sailor moon, Pullip, pullip x sailor moon, sailor moon. Bookmark the permalink. Though I’m quite worried, I might want to have them all! xD just kidding. Thanks for the review! Her poses are just sweet.